Life presents us with many realities, some of which we might struggle to reconcile. There are experiences we would rather not endure and situations we would prefer to avoid. There are mindsets we find confronting, and histories—both personal and communal—that now rest uneasy. As emotional states, these sensations are a necessary side effect of being human, but it is how we rebuild ourselves in the face of these feelings that gives us our humanity. This reconstruction of self has been central to Carolyn V Watson’s practice for almost two decades. As a young artist grappling with the hangovers of her upbringing, Watson sought to disseminate her past through a rigorous painting and drawing practice. Recognising early on that incorporating three-dimensionality would develop both her art processes and her personal examinations, Watson gravitated towards the feminine grotesque aesthetic embraced by Australian sculptors Patricia Piccinini, Linde Ivimey and Juz Kitson, and the oddly composed therapy dolls of German artist Hans Belmer. Where working two-dimensionally ensured immediacy of message, the expansion of materiality and physicality provided by sculpture allowed more opaque motivations to be considered. Labour-intensive techniques including hand stitching, molding and assembling enabled greater depth of focus and more fully realised ruminations, while materials such as bone, wax, leather and rabbit pelts gave Watson’s work the emotional potency she sought. The resulting creatures—anthropomorphic beings with beseeching gazes and tentatively curious postures—were fleshy in appearance but hardened to touch. Given titles that read like little poems (allmygodsarewithme, hidinginplainsight, breathturnedblank) the works felt confrontingly raw, yet exuded a vulnerability that enchanted audiences. More than a decade on and Watson’s current work shows the private and professional transformation that has taken place. modifiedwonder has provided the opportunity to redefine her practice. Though still intrinsically linked to the self, it is much more about the sheer joy of experimentation and creating. Existential angst has given away to consideration, while the deliberate erasure of recognisable features has led to a renewed focus on surface, repetition and connections between unfamiliar forms. Unidentifiable as either animal or mineral, the sculptures no longer seek, nor are capable, of engagement with the audience. The works are riskier, their resolution more certain. The drawings too have undergone metamorphosis, edging closer to the sculptural with a move from linen to board, and interplay between line, tonality and absence. Resembling fragmented journal entries and misremembered anthropology studies, they provide an anatomical view of the sculpture’s supportive underbelly while also taking viewers further into her most delicate contemplations. Rarely self-contained, the drawings come together like a puzzle to provide an overall map of Watson’s practice, inspirations and her motivations. Watson’s fantastical hybrids now appear content to exist as improbable botany; a series of exotic marvels indifferent to the curiosity they elicit. Born in regional NSW, Carolyn V Watson is a multi-award-winning artist whose work has been exhibited in solo and group shows throughout Australia. In 2017 she won the prestigious Shilliam Award Frank Lambert Memorial Prize at the Brisbane Sculpture Festival, and was invited to exhibit at the internationally-regarded World Science Festival, Brisbane. In 2016 she was awarded both Best 3D Work at the 37th Brisbane Rotary Art Spectacular, and the Perides Art Projects Award. She is a seven-time finalist in the Moreton Bay Regional Art Awards, a six-time finalist in the Marie Ellis OAM Prize for Drawing (Honourable Mention, 2011), and was selected for the 2012 John Fries Memorial Prize and the 2008 Churchie Emerging Art Prize. In 2015, her solo exhibition allgloryisfleeting(memoryandhand) was presented at Bundaberg Regional Art Gallery to wide acclaim. 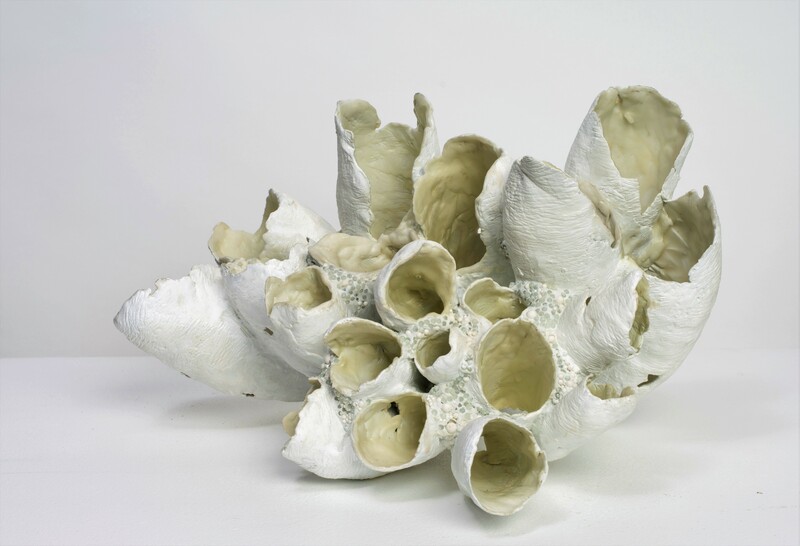 The 2016 Artist in Residence at St Luke’s Anglican College, Bundaberg, she holds a Bachelor of Fine Art, Queensland College of Art (1998), and her work is held in public and private collections in Australia and internationally. Catalogue Essay, commissioned by the artist.